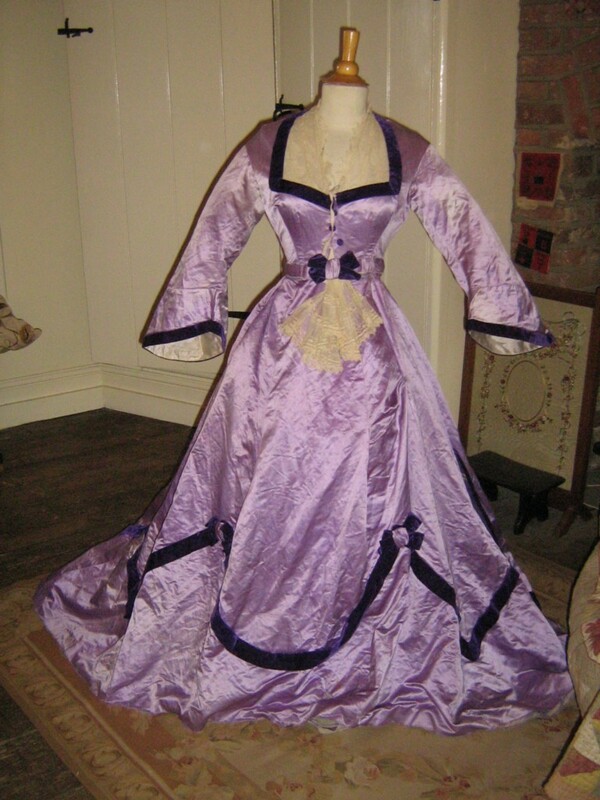 >This beautiful gown with it's swags and bows was probably for half mourning, as it is a strong violet silk satin with purple velvet features. It needs to go to a competent dressmaker or perhaps a final year design student to sort out two serious issues [although there are other problems less serious]. The first is that the waist is a complete mess and needs to be changed. 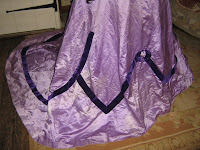 All the damage is centred at and around the waist, so this is a do-able job. The second, far less a problem, is that the whole of the fold of the bottom hem [quite huge!] is split and needs complete re-hemming. 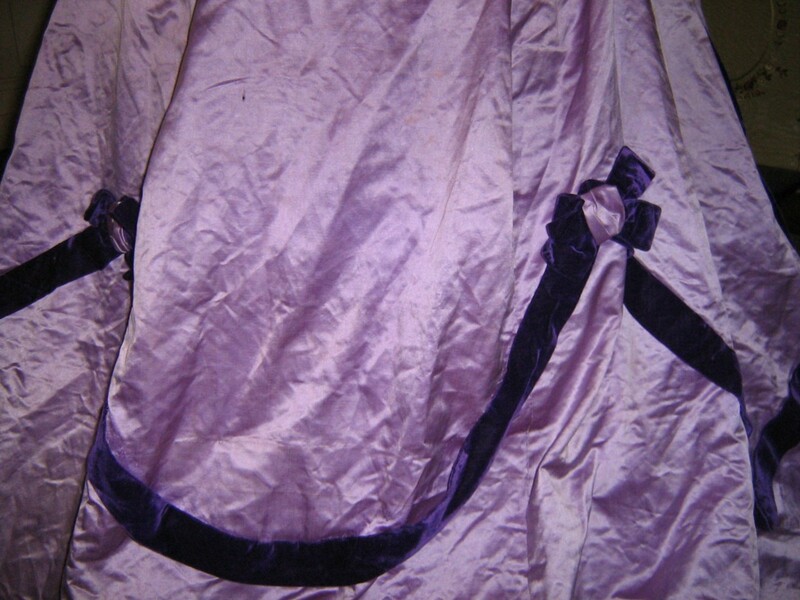 The dress has an interesting history! Originating in Scotland, the dress appears to date to the 1860's as it is now, with it's pagoda sleeves and huge trained skirt. However, I believe it is possibly earlier than this. I think that the bodice and skirt were originally seperate, and that the pagoda bottoms to the sleeves are add on's to update the gown to the fashion of the 60's, and it could have originally been bell sleeves. 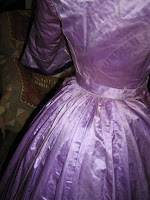 Pagoda sleeves, even with lovely silk linings, should not have a seam in them as far as I know! 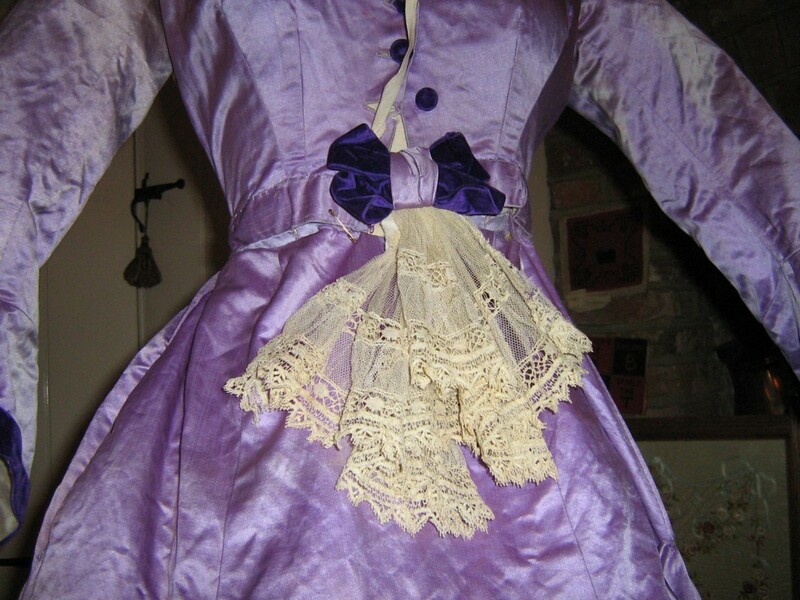 The vast amount of hand stitching is simply fabulous, but the few areas of machining show the 1860's changes. This just what I THINK, not what I know! However, I do know that the dress was then again worn in the 1940's or thereabouts, as I have removed 1940's shoulder pads!!!!!! and a 1940's powder puff hankie from the pocket!! 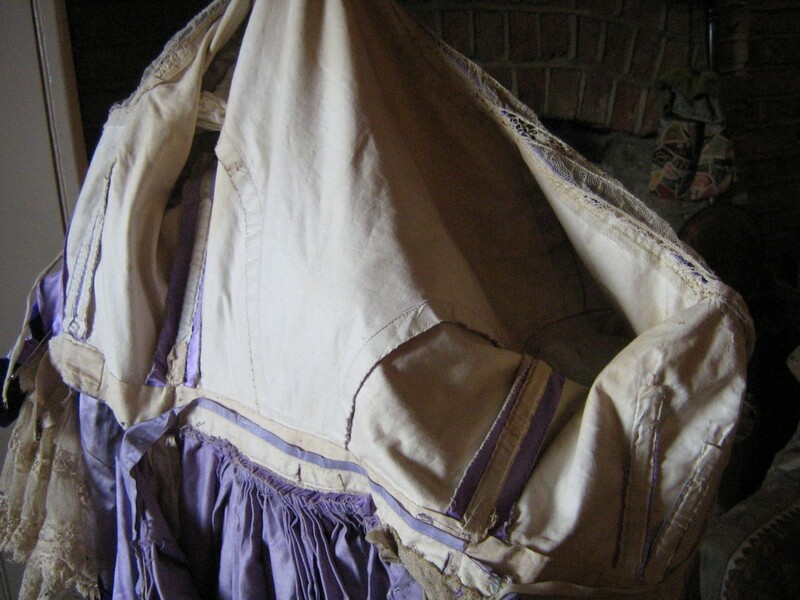 If only this lovely garment could talk! What a tale she could tell! 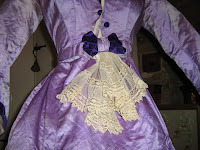 The dress still has it's three original velvet buttons and the lace is also 19th Century. There are interesting tape ties at the front of the bodice which are also original. 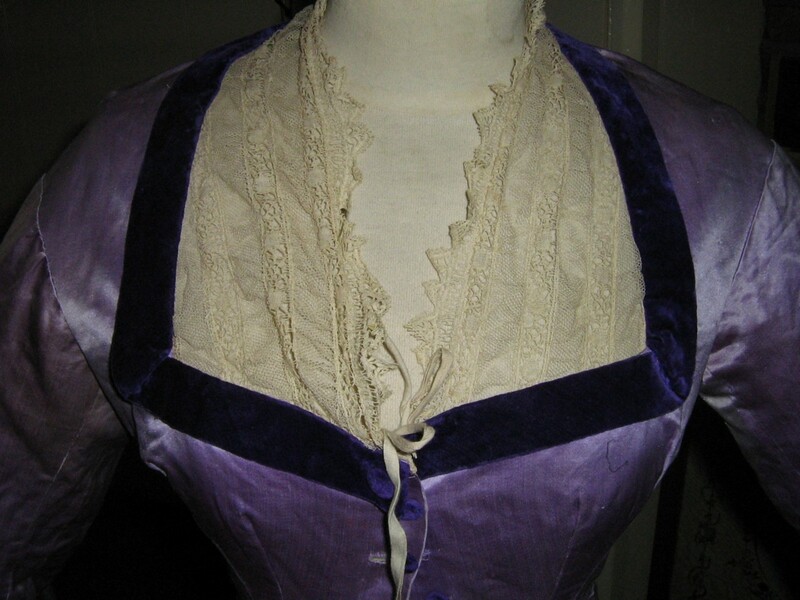 Pinned to the waist is an extra bow and lace jabot, which I am sure would have been fixed to the neckline, not the waist, but you have the luxury of placing it where you think is appropriate! The exterior underarms are fine with slight underarm lining staining. 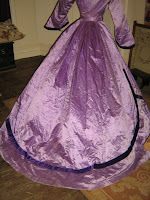 The bodice lining and bones are certainly 1860's or earlier and the gauze to the skirt hem is also original. 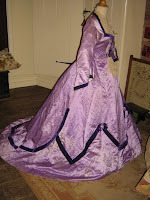 The vast bulk of the fabric throughout the gown is strong, but there are small patches of wear/shattering to one shoulder, and the lower centre back. There is gentle fading to the colour which is not stark and unpleasant, but is obvious. There is a series of nasty holes to the front hem spanning around 3", which will certainly need to be patched. There is staining, especially to the lower back train. 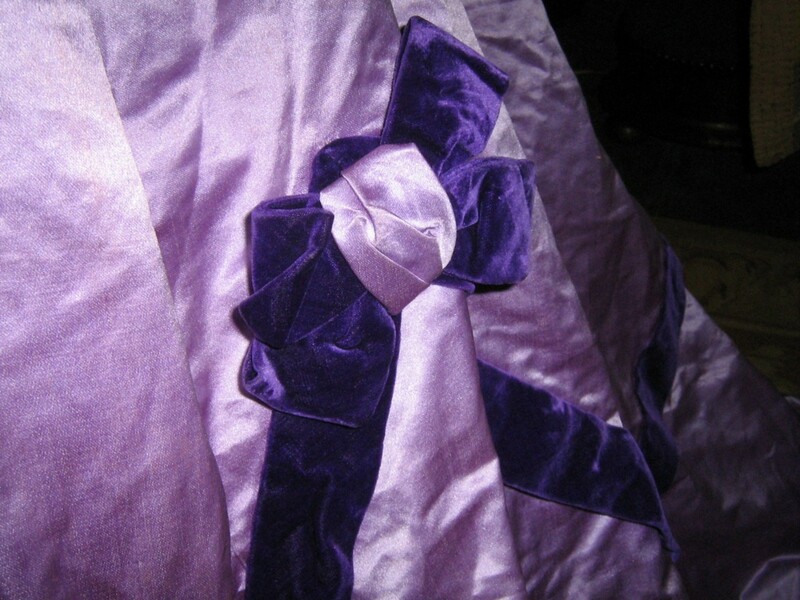 A biro squiggle to the front bodice [shown] can be covered by the jabot. 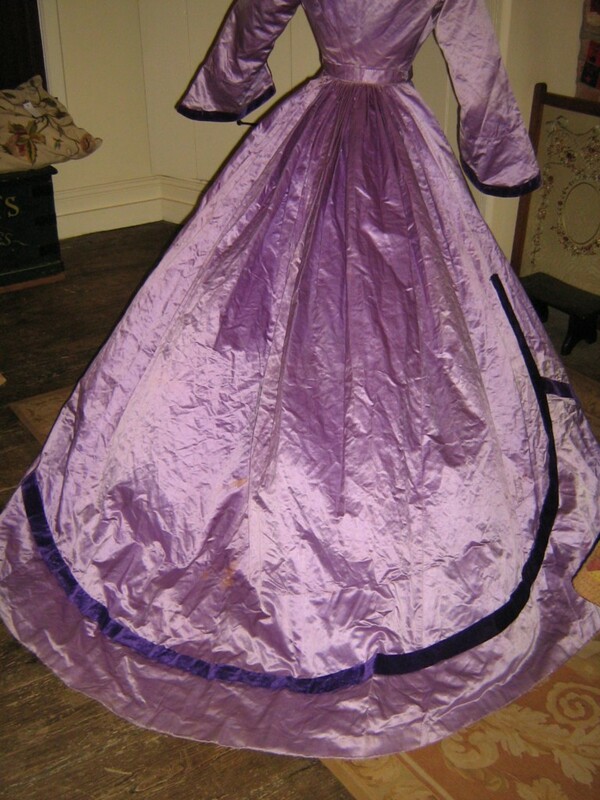 As a display piece, with lots of space around it for the lovely skirt, it is a remarkable colour and very much a conversation piece for historians. The dress will just fit my 33"/23" mannequin except at the midriff so you will need to be 32/22" to wear it. I want to make this dress. It's lovely. 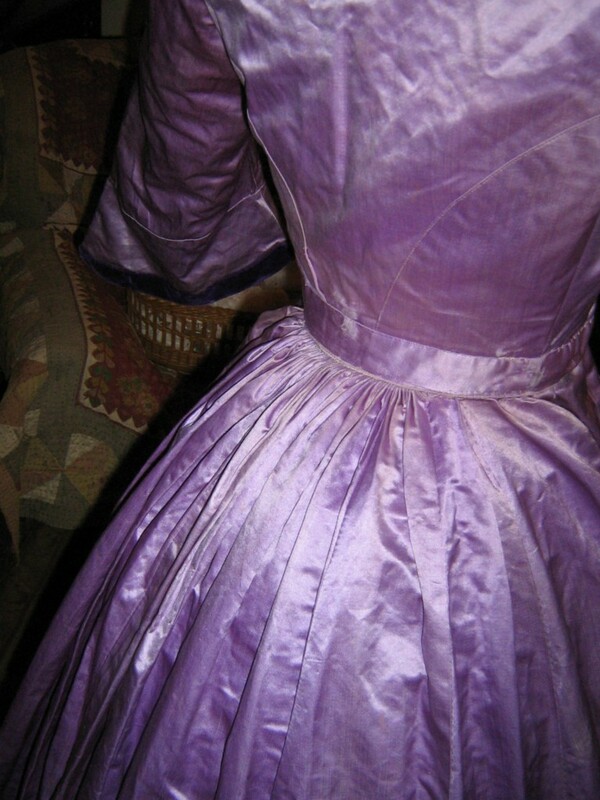 The velvet accents on the lavender gown is just stunning.